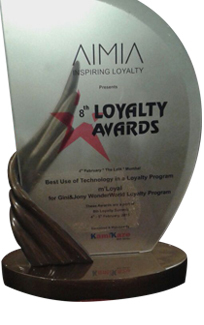 Mobiquest Mobile Technologies has won another award for m’Loyal, our mobile loyalty platform, at the Loyalty Summit 2015, held on 4th & 5th February 2015, The Lalit, Mumbai. The ‘Innovation in Loyalty’ award has been conferred upon us for the ‘Best Use of Technology in Gini & Jony Wonderworld Program’. The 8th Loyalty Summit had prominent names of the industry from across the globe as speakers talking about various aspects of the loyalty business including Loyalty & Design, Social Media as a powerful loyalty tool, Customer Loyalty – The Next Generation approach, etc. 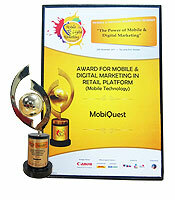 The award was received by MobiQuest team at the Aegis Awards ceremony held at JantarMantar, Delhi. 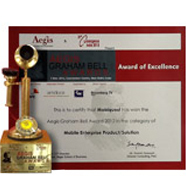 Aegis Graham Bell Awards is the only and the largest innovation awards for Time (Telecom, Internet, Media & Edutainment). M’loyal is the leading, most comprehensive self-serve Mobile Loyalty Platform deployed across India, Malaysia, Dubai & Singapore by over 120 brands and engaging 40 mn+ consumers on the m’loyal network. 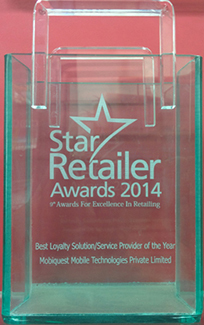 MobiQuest won an award last night at the Star Retailer Awards 2014 organised by Franchise India for the “Best Loyalty Solution & Service Provider of Year” at the Lalit Hotel, New Delhi. Bipasha Basu and Herman Baweja amongst other eminent Retail Personalities did the honors of the Award distribution. Some of the other Awards that got conferred were Best Franchisor, Best Retailer of year in different categories across Fashion, Food & Dining, Health & Wellness categories. Accolades came pouring in for MobiQuest when it got recognized by Amity Business School, India’s Top Ranked B-School. 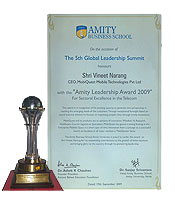 It was the 5th Global Leadership Summit held by Amity and we received the ‘Amity Leadership Award 2009 – For Sectoral Excellence in Telecom’. The Award was conferred upon our CEO Mr. Vineet Narang for displaying exceptional foresight in enhancing people’s lives through groundbreaking innovations at MobiQuest. Amidst an august gathering of business luminaries, MobiQuest was honored at the prestigious World Brand Congress/Digital Market Summit award in November, 2011. The award for outstanding contributions in ‘Mobile and Digital Marketing in Retail Platform (Mobile Technology)’ will inspire us to strive harder in the times to come. Innovation and Excellence has become synonymous to Mobiquest. With an exceptional team of think tanks, it has become possible once again for us to get recognized for our collective and distinct efforts. 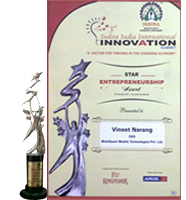 At 3rd Indira India International Innovation Summit, Vineet Narang, CEO, Mobiquest Mobile Technologies, was honoured with the Star Entrepreneurship award. It is another milestone in our long journey and a motivation for us to keep innovating. The awards honored the best innovations in the field of TIME. This award was initiated by Aegis School of Business and Telecom & 21st Convergence India 2013 and supported by COAI (Cellular Operators Association of India); PwC as Knowledge Partner for validating the awards.